Gill leaves school after Kahuna Bob, his surfer hero, offers to train and mentor him. It'll take more than Schneider, and Gill's schoolmates, to persuade him back to class. Max Schneider: [Mr.Schneider has everyone in his class outside the school sing the Gravedale High during the opening theme] Please take a seat, yeah, we're dying to meet ya. "Gravedale High" was an excellent cartoon, and was in the spirit of the great 80's cartoons (but in 1990). 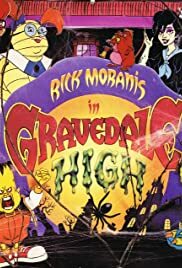 Somewhat resembling TMS Entertainment's cartoon "Galaxy High School" (1986-1987), Gravedale high depicted a chilling high school of monsters, which included Sid the Invisible Kid, Cleofatra, J.P. Blanche, Frankentyke, Vinnie Stroker, Gill Waterman, and Duzer. The students were taught by Mr. Schriner voiced by Rick Moranis. This was all followed by a great theme song.